I am not entirely sure why I am even starting this post. I haven't posted for almost a year and a half when Aaliyah and Jocelyn graduated from YMCA preschool. I wrote about the challenges of that time and now I look back wishing I could have just a moment when my kids were a little simpler. The problems back then were waking up too early in the morning, teaching them how to say please and thank you, 5 buckle harnesses, making sure we packed enough snacks and formula, putting on 8 shoes, and getting them to stop pooping in their pants. These were the simpler things in my life friends. Then they did it...they went and grew up (a little). I was so excited for school (aka: free daycare) and then it got harder. I turned in packing 4 lunches to forking out hundreds of dollars on canned peas, pizza dunkers, and chicken surprise. I turned in walking 4 kids into a building for dropping 4 kids at the corner and just praying that they don't lose anything on the bus because if they get to school without it they are only allowed to play on the blacktop. I turned in zero backpacks to 4 backpacks full of left over, mushed snacks, crumpled papers, and literacy bags (which don't always make it home). Don't get me wrong, there are so many things I enjoy about the kids growing up. For example, their creative, social interactions, and enjoyment of playing together. There is an advantage to having 4 kids close in age especially when it comes to amusement parks and picking a movie. Not asking for anyone to fix it, but this is my blog. And today as I was driving the kids home from the the grocery store - yes I took them all in by myself - I was thinking about other times in my life when I was so overwhelmed and it just felt better to write it, not to mention that someday my kids will read this and apologize about standing on the donut counter to see the red and green sprinkled donut on the top shelf. People, all I wanted was grapes and bagels! Anyway, it is what it is. There probably is not another person out there that can totally get it. The combination is different and the chaos is unending. We just traveled to Jamaica, so there was an entourage that all took their time with the kids, however, not one person was "lucky" enough to take on the entire experience. A few people commented, "I don't know how you do it" when I think "and you got to leave!" It was also a nice reminder that I might actually be doing something good. I probably should be more relaxed after nine days in the beautiful sun but coming back to life was a wake up call of how much I am responsible for. I am guessing my friends in Jamaica won't believe me. This feels like the most difficult year, but unfortunately most likely not. As I plea for help from the teachers, call my sisters asking for advice, complain to Brett about the awful mornings and let's not forget the "fix it" slip in Bennett's bag...I really need to remember I am ok because they are ok. I am not perfect but they don't expect me to be. 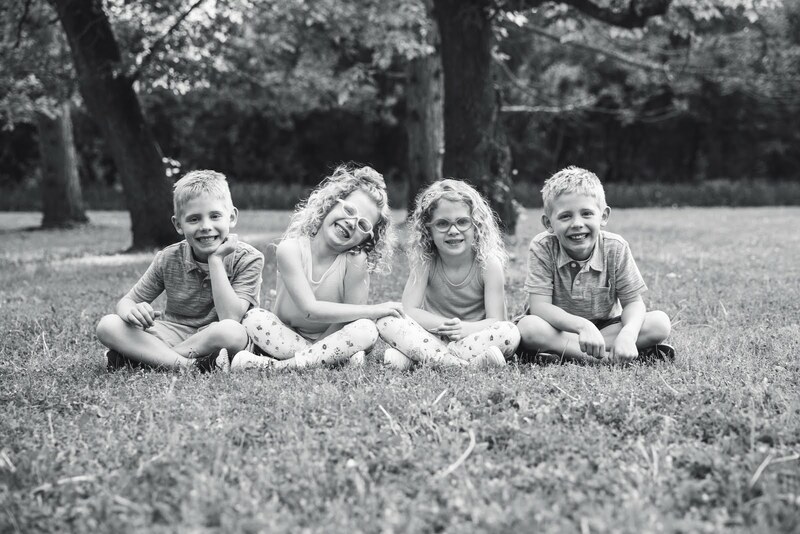 I leave you with a picture of the 4 most amazing (and cute) kids in the world. I better catch up!